A Baltimore Ravens player is under fire after offensive tweets from the past resurface. 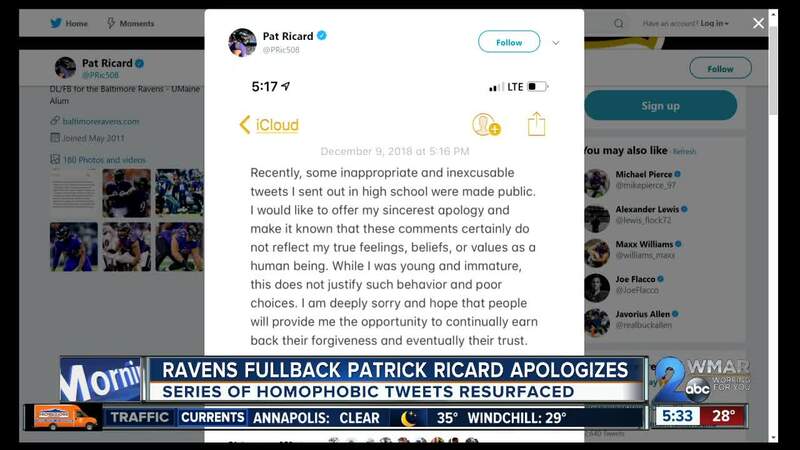 BALTIMORE — Baltimore Ravens player Patrick Ricard is under fire after offensive tweets from the past resurfaced. From 2011 through 2014, Ricard wrote multiple insensitive tweets, which included homophobic slurs and racist terms . After Sunday's 24-27 loss to the Kansas City Chiefs, Ricard spoke on the issue . Ricard, a fullback for the Ravens, released a statement on his Twitter page. The Ravens organization also commented, saying, "The tweets are totally unacceptable, and we have addressed the matter with Pat." This isn't the first social media controversy involving athletes. In July, former Baltimore Orioles minor leaguer and current Milwaukee Brewers closer Josh Hader was ordered by Major League Baseball to complete sensitivity training after old tweets were discovered . On Sunday morning, 2018 Heisman trophy winner Kyler Murray apologized for anti-gay tweets he made several years ago. All tweets in Ricard's case have since been deleted.